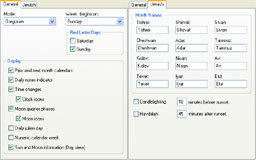 Einstime's main calendar window is configurable with a variety of options you can tailor to your preferences. 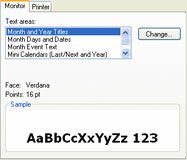 Separate settings allow you to specify unique Monitor and Printer fonts. 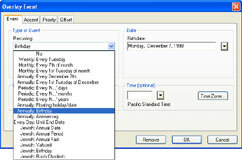 Overlay files add the capability to add and remove complete sets of holidays and events from your calendar quickly and easily. A wide variety of special date types are available to create any event you desire. 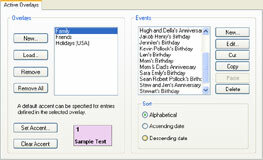 Color accents or icons can be added to events to personalize your calendar even more.